Real Madrid had no difficulties in running over Espanyol by 6-0 tonight at the Bernabéu and Ronaldo took his chance to seize the moment with another hat-trick. Benzema, James and an own goal from Óscar made the count go up to 6 goals on the night. Another home game for Real Madrid and another massive victory, this time 6-0 over Espanyol, who are now 15th in La Liga. The Merengues have done the double over the Catalan side this season, with an aggregate score of 12-0. It was a happy day for Cristiano Ronaldo all along, who netted a perfect hat trick and now finishes with 8 goals in two games against Espanyol this season. Along with the Portuguese man, James Rodriguez and Karim Benzema also contributed, with an own goal from the away team rounding out the result. Real Madrid now only plays next Sunday in a away fixture against Granada. Like the recent game against Gijon, where Real Madrid won 5-0, the Merengues were able to kill the game early in the first half. A header from Benzema, a penalty from Ronaldo and a deflected James Rodriguez shot, gave Madrid a 3-0 lead within the first 20 minutes, but it was the goal near the end of the half that would be the talking point of this game. Vintage Ronaldo it's being called online. 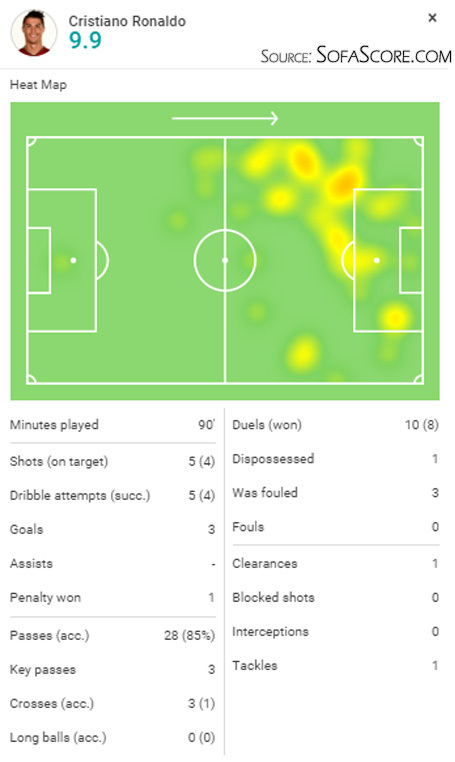 After another deflection, off a James pass this time, Ronaldo sprinted towards goal before dribbling past two players and lasering a left-footed shot past the keeper. 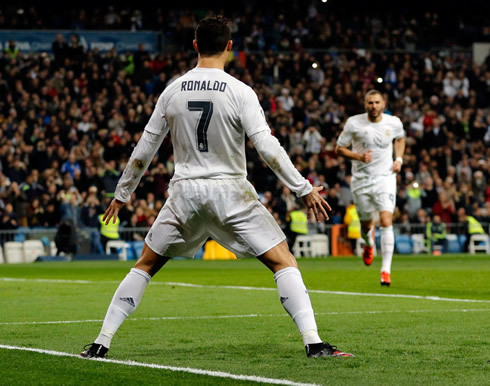 It was an amazing strike, the kind of goal that brings the Bernabéu to its feet. It was also the kind of goal Cristian Ronaldo scored far more frequently in the past, so it was nice to see him shaking off the rust today. 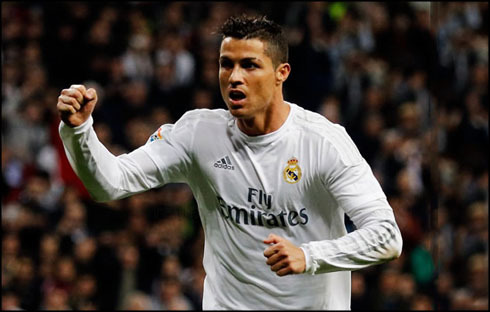 The second half would be more of the same, as Madrid continued to romp past their rivals. Ronaldo would net his hat-trick after a header in the box and substitute Jese Rodriguez's smart work on the wing would led to an own goal late, capping off a fantastic night for the hosts. La Liga may be a long shot now, but with Atletico's loss to Barcelona, Madrid have closed in on second place. Under Zidane, the team's intensity, especially early in matches, has really picked up. Even Ronaldo recently admitted he's been working a lot harder under Zizou. It still remains to be seen how the team will perform in the biggest games, but for now, things seem to be improving. 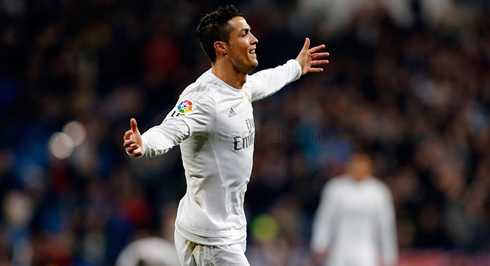 Cristiano Ronaldo next game will be for Real Madrid in La Liga on the 7th of January of 2016, against Granada. You can watch Juventus live stream, Granada vs Real Madrid, Sunderland vs Manchester City, Manchester United vs Stoke City, Arsenal vs Southampton, and Liverpool vs Leicester City, all matches provided from our soccer live game pages.